Charles Darwin, on his well known and documented voyage to the Galapagos Islands, identified 16 species of finches. These finches provided the underpinnings for his theory that species evolve to suit their environment. 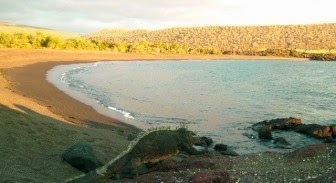 Now, throughout Galapagos, there are only 15 species remaining, the rest having become extinct. 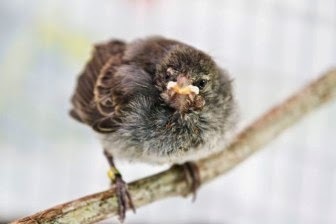 In a recent post I told you how scientists are working with Galapagos finches to save them from an invading parasite. Other scientists are doing work to save the Mangrove Finch, also nearing extinction and on the endangered species list. Humans are inadvertently responsible for the decline in population, caused by rats brought to the islands on pirate ships and other parasites introduced by flies. Fortunately we are able to intervene in positive ways to stop extinction. And that is exactly what is being done with the Galapagos Mangrove Finch. 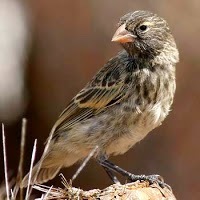 The little finch used to be found in the dense mangrove swamps on Fernandina and Isabela, the two "newest" islands in the archepelago. Now none of these birds remain on Fernandina. According to the researchers, the population on Isabela, all in a small area at Playa Mann, has now dropped to between 60 and 80 birds, making them an endangered species. 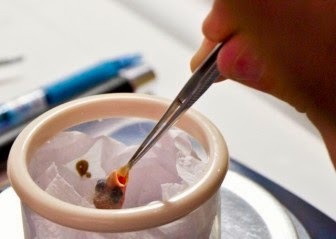 To try and boost numbers, scientists are now raising and breeding chicks in captivity on Santa Cruz Island, feeding them scrambled eggs, papaya, wasp larva and wax worms and freeing them from the invasive parasitic fly that is encroaching upon their existence. A total of 13 chicks have been hatched in captivity so far. The plan is to release them first to a protected environment and then back to their natural habitat in the wild. More eggs have been collected and will follow the same protocol. In addition to the eggs, scientists have rescued three chicks that were born infested with the fly. They found a way to deprive the fly larvae of air and and kill it. Two of the three chicks that were subject to this process were able to survive. The challenge is just at the beginning stages but early results make us hopeful for the future of the Mangrove Finch. In addition to private foundations and individuals, the project is funded by Save Our Species, the International Community Foundation and Durrell Wildlife Conservation Trust.